If you’re a parent I’m sure you know (or at least have heard) of the brand Chicco. They have tons of great products that are loved by many. I’ve tested and used several of them myself and it’s apparent to me that Chicco is all about safety and quality. This is why we are big fans of them here at Baby Chick! I’m pretty familiar with a lot of Chicco’s products like their car seats and their strollers, but I hadn’t seen or tried their new Chicco Mini Bravo stroller . . . until now! My son and I went on a little adventure one weekend with the Mini Bravo and it did not disappoint. Chicco really has taken the great features of their Bravo stroller and made it more compact and perfect for the family on-the-go. Here’s what I love about the Chicco Mini Bravo and why I am recommending it to families. If you have the Bravo stroller you know that it’s not a heavy stroller–weighing only 23 pounds. But Chicco has made their Mini Bravo stroller even smaller and lighter for all of us parents–just 18 pounds! That’s about the weight of my kid. lol! The Mini Bravo still has the same great features of the Bravo, it’s just more compact. This makes traveling and carrying the stroller much better and easier. The folded dimensions are 28.3 inches x 20.8 inches x 14 inches. That’s pretty small, considering that it’s not an umbrella stroller. And even though the the size of the stroller may be smaller than the Bravo, the new Mini Bravo is just as strong. 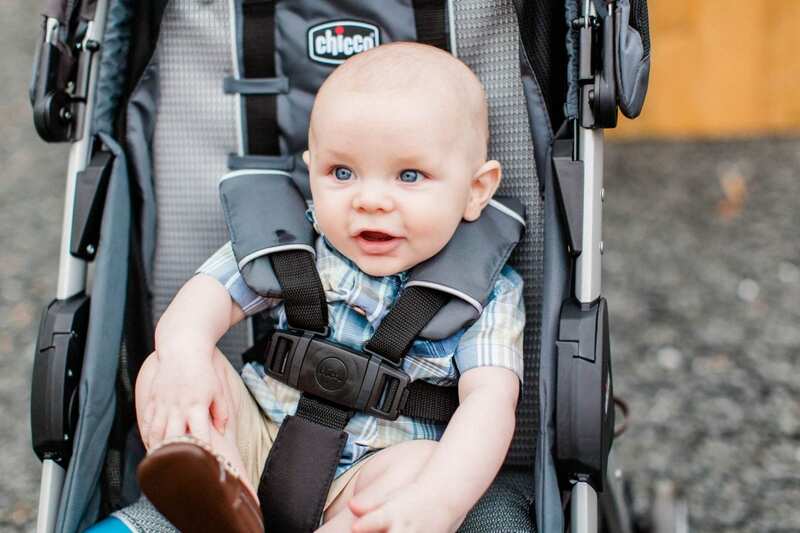 The stroller can support a child from 6 months old all the way up to 50 pounds! Speaking of the fold, this feature is what really sold my husband! He can never quite figure out how to open and fold strollers correctly. I always have to come to the rescue. This stroller makes it super easy even for the stroller-illiterate parent. This innovative folding design is the bomb! All you need to do to fold the stroller is grab the handle located under the seat, slide the latch to unlock, and pull up the handle, and the stroller folds in on itself. It’s really that simple and is definitely my favorite feature. When you are a busy mom on-the-go you need to be able to put things down. Heaven knows that your hands are constantly full and busy. We need our strollers to stay put. And this stroller is self-standing once folded up. All you have to do to open it is pull up the handle bar. That’s it! No buttons, latches, nothing. This may be a smaller stroller but the storage basket underneath is still large. 🙂 This is something that is important to me since I need it to fit my large diaper bag and anything else that I need with me. I also like that it’s easy to get to no matter what recline position baby is in. I LOVE that this stroller has a super simple 3-position reclining seat that you can adjust with just one hand. Yes! All you have to do is pinch the latch together on the back of the seat and pull down. I’m really impressed–and grateful–how Chicco has made all of the features on this stroller super easy. What’s also nice is that they used vented fabrics on the sides of the reclining seat and on the canopy. I don’t want my baby to overheat while sitting in his seat. Having some airflow helps him stay comfortable, happy and cool. There’s even something special for the parents! Not only is there a nicely padded push handle on the stroller, it also has a parent tray. There are two cup holders on the parent tray, which is great since there isn’t a kids tray. This way you can have your drink and your child’s sippy cup ready to go. In the center of the parent tray you could store your keys, your phone, snacks, etc. I like and appreciate how the 5-point safety harness is padded. I’m sure my baby does too. No one wants a seat belt digging into their skin–especially our little ones. The Mini Bravo has padding on both the shoulder areas and a thick, padded bottom buckle strap. Click it all together, and with a snap of a button it quickly disassembles! It may be a small stroller, but this ride has spring suspension, good-sized wheels and a sturdy design. Bumps aren’t as bumpy so you are smooth sailing when strolling with this stroller. It also has front swivel wheels that make steering a breeze! The Mini Bravo stroller features toe-tap rear brakes. These work by braking each side individually. Press down on each side to fully lock the stroller and then lift up with your foot to unlock those wheels. For a lightweight stroller that keeps your child comfortable and easy for you to use, this is a great option! The quality is wonderful and the features–as you’ve seen–are awesome. If you are needing a travel system, the Mini Bravo Plus allows you to clip in your Chicco car seat with a clip-in attachment. Love that! Both are very well made. Yes, the Chicco Mini Bravo is a little pricier than some other lightweight strollers, but I can tell that this stroller is designed to last you and your littles for years to come.